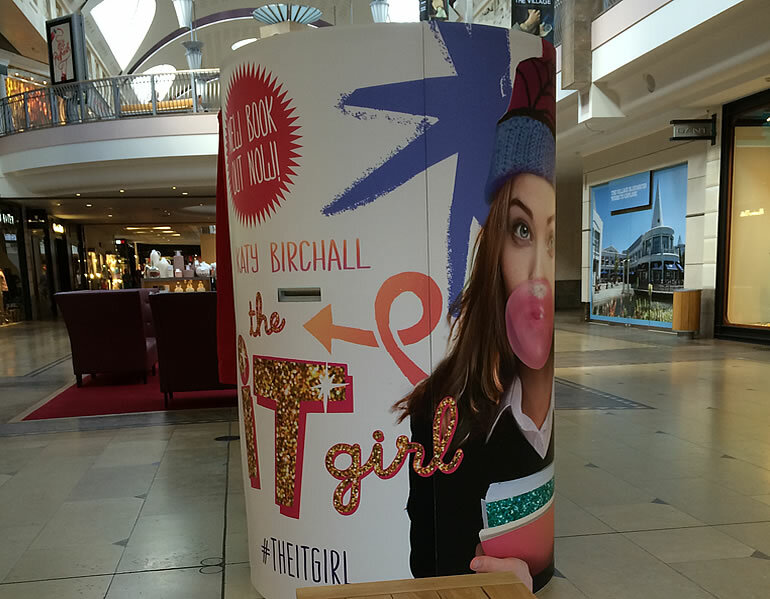 Our latest photo booth hire has taken us into the exciting world of Young Adult publishing, working for specialist children’s publisher Egmont this summer, which has booked Photoboothy for three separate dates to mark the launch of Katy Birchall – It Girl. We’ve just completed the first, which took place at Bluewater in Kent. Fans received a £2 discount when they purchased Katy’s entertaining book, then proceed to enjoy snapping themselves with their copies all day long. Katy is the exciting debut author of The It Girl who also works at Country Life magazine. Her hilarious, ‘clean teen’ fiction debut will be followed by a second book in 2016. It’s a lighthearted YA read, one that has readers instantly connecting with Anna Huntley’s teenage trials and tribulations when her father becomes engaged… to a world-famous actress! Bluewater’s busy shopping centre proved an ideal venue for this, one of Photoboothy’s many available photo booth hire options, with plenty of day-long footfall, lovely feedback and interest in hire options. We spent 12 hours with It Girl fans, who loved the souvenir branded photo strips, something we provide at no extra cost. All our photo booths come with social media sharing options too. It Girl is certainly getting around this summer and after our photo booth hire Kent appearance you will find us at the London Film and Comic Convention/YALC at Olympia, London, on July 18, then further afield at Waterstones, Bath, on September 26. We’re a helpful, experienced and innovative supplier, happy to provide stand alone or enclosed photo booth hire for shopping centre events or bookstore launches throughout central London, Kent, Essex, Surrey and Hampshire – and other locations – so please get in touch to tell us more about your requirements today.